I had a chance to read some of the issues of your esteemed journal 'Sindhishaan'. The name is so cute and appropriate. 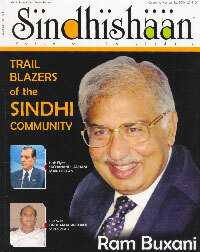 In one old issue Sindhi female writer are projected and some articles about female characters. Sindhi poetry are brought to readers. The issue is very well edited and articles of great visionary value. The issues that I chanced to read carry articles by Shri Arun Babani. He has a flavour for Sindhyat. Each article has some permanent value. If such articles are brought out in book form, it will form part of Sindhyat movement and a good guide in future. Your journal serves a very great purpose as it focuses on sindhyat and literary movement in our language. Keep the flag flying high.